I’ve been thinking about timelines. Timelines organize a lot of historical writing. They frame discussion. They can also be problematic. Here is Shakespeare’s timeline from As you Like It. Shakespeare’s seven ages of man is an easy timeline to critique because of its so obvious bias. It starts with a universal, the mewling and puking infant and ends with a universal, a shank shrinking old age, but in between it marks the life passages of a man. Literally, a human male, not a universal human. Growing a beard and being a soldier is one of the life markers. For women who birth mewling puking infants the heart of the timeline fails them completely. Worse, if we rely on Shakespeare’s structure for thinking about the arc of lives, we will find that we have failed at offering insights into he structure of half the population. This is a timeline that is super easy to critique. But it is a good illustration of how timelines tell stories, but if it isn’t conceived to tell your story, then you are pretty much out of luck. The history that I write is often concerned with the lives of ordinary people and the breads they eat. Dynastic timelines, like those used to mark the history of Ancient Egypt, are useful in tracking the history of the ancient Egyptian dynasties but offers no meaningful markers to the lives of the average ancient Egyptian, and rarely offers a signpost of any value to understanding the breads of daily life. The grains began to change at the beginning of the Ptolemaic era which would, for the first time, be a dynastic change affected village bread. The Samburu tribe I stay with in Northern Kenya build structures of sticks and dung that are consistent with structures built in the very distant past. Ideas like Neolithic, Bronze Age, Modern, Post Modern just don’t apply. When it comes to bread, it doesn’t really matter the fine gradations of stone tool formation, or which metal had been mastered. The underlying technology of importance to bread is the milling and sifting implements, and baking technologies. These are al technologies that change very slowly. That India has nuclear weapons doesn’t help us chart the village breads milled on hand querns and baked, unleavened, on dung fires from antiquity to the present. These aren’t original thoughts. As I struggle to tell a story about bread that is true I find myself thinking about timelines in general, and what a bread-centric timeline might look like. If you have some ideas, please share them. 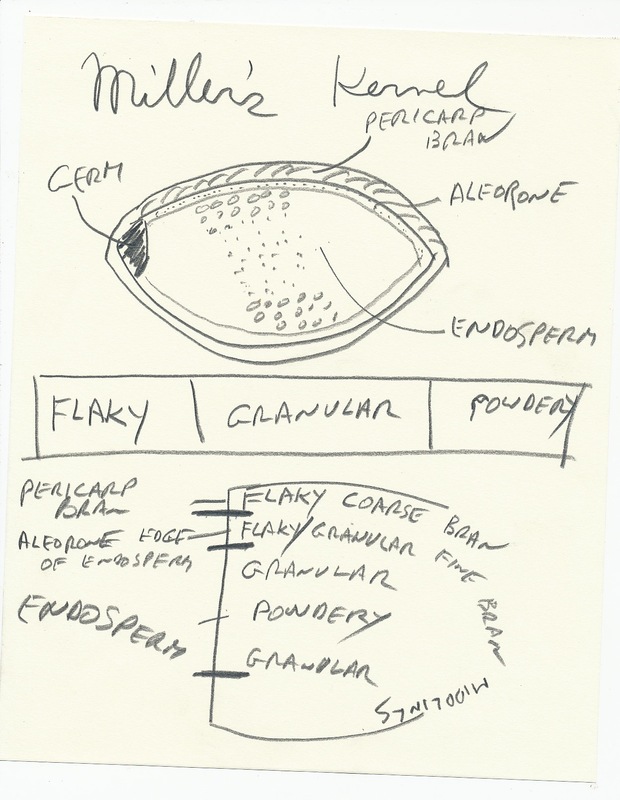 This is a drawing I made to illustrate grain in terms of structures millers pay attention to. Stone milling is the art of grinding grain into a meal, and then through sifting and re-grinding (and re-sifting), refining the product into the quality flour one wants for the finished product. While sifting determines the final quality of flour, the ratios of what is produced (and thus profit) depends heavily on the precision with which the miller creates the feedstock to be sifted. Millers were constantly feeling the flour that came out of the mill. Millers did this so much they deformed their thumbs — thus there is a fish that is called the Millers Thumb, the European Bullhead (Cottus gobo). Judging by an image of the fish, the miller’s thumb was widened at the fleshy pad — presumably with a thick callous. The British artist, John Constable’s father was a miller. Following is, apparently, Constable himself, explaining how millers use their thumb. This is from Cassell’s Popular Natural History, Volume II, 1854, p. 103. The father of the late John Constable, Esq., it.A., was a miller, and our eminent English painter described to Mr. Yarrell this singular form of the human thumb. “It is well known,” he says, “that all the science and tact of a miller is directed so to regulate the machinery of his mill, that the meal produced shall be of the most valuable description that the operation of grinding will permit, when performed under the most advantageous circumstances. His profit or his loss, even his fortune or his ruin, depend upon the exact adjustment of all the various parts of the machinery in operation. The miller’s ear is constantly directed to the note made by the runningstone in its circular course over the bed-stone, the exact parallelism of their two surfaces, indicated by a particular sound, being a matter of the first consequenoe; and his hand is as constantly placed under the meal-spout, to ascertain by actual contact tho character and qualities of the meal produced. It is blackberry season and I just came across this amazing USDA (United States Department of Agriculture) website containing images in high resolution scans of of 7,300 fruits (mostly apples). Enjoy! 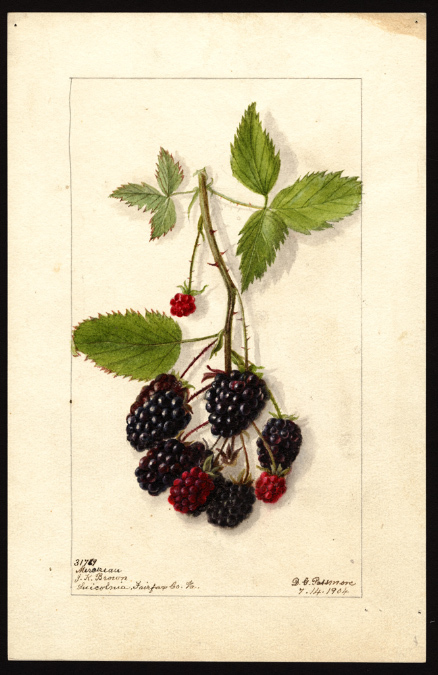 Here is an article, The collection of pomological watercolors at the United States Department of Agriculture, published in 1982 in the Journal of Botanical history by Carnegie-Mellon University. And, also, a recent article in Slate. I would like to call your attention to Stanley Ginsberg’s rye bread blog, The Rye Baker. The recipes in the site are varied. The geographic region unusually large — from the Alps to the Baltics — and the recipe notation is impeccable. Stanley has a book, forthcoming as of this writing — The Rye Baker: Classic Breads from Europe and America. Stanley’s interest in rye began with what in America we call “Jewish rye.” It is a wheat/rye mix, usually yeasted, with caraway seeds. It is far more wheat than rye — a bread that would be unrecognizable in the countryside of Northern Europe where the people who created this bread in America came from. Judging by the recipes posted on Stanley’s blog, his book will be hugely informative.